Sunshine State teams will count cash even if they’re not cutting down nets. The Big Dance (aka the NCAA Division I Men’s Basketball Tournament) lies just around the corner and, with it, a big payday for the annual participants. Though not as lucrative as college football’s bowl games, tournament payouts still are significant – especially for conferences comprised of schools that do not field big-time football teams. That’s why all but the major power conferences will be nervously watching the NCAA Men’s Basketball Selection Committee’s decisions this Sunday. 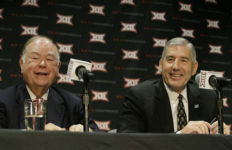 The economics of the tournament are that critical to many conferences and their member schools. The NCAA has a complicated formula for dividing up the revenues from the basketball tournament, which the Washington Post reported generated $700 million overall last season and $220 million for the organization’s “basketball” fund. That $220 million is divided into “units,” a term everyone interested in the business of college sports should get to know. Last year, each unit was worth $1.67 million, payable across six years to the conferences of the participating tournament teams. Making the tournament earns a conference a unit per team selected. Each subsequent win by a member team or teams also is worth a unit, up until the Final Four. For the so-called Power Five conferences (ACC, Big Ten, Big 12, Pac 12 and SEC) that field multiple teams and make the Final Four regularly, the payouts are significant but are a relatively modest portion of their revenue. Schools in those conferences all field major football teams – by far the biggest source of college athletics revenue – plus their own basketball television packages also generate big dollars. To understand the impact of the math, look at the Big 12 Conference, which is projected by CBS Sports to have seven teams in the tournament. Based on last year’s unit value, that’s $11.7 million in the bank even if every team loses its first game. 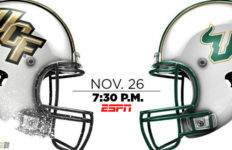 However, the conference earned far more than that from the College Football Playoff and the other bowl games in which member schools participated. For other conferences, the total sum of the payouts may be smaller but the impact on them and their members’ revenues are much larger. For the American Athletic Conference, which includes UCF and USF, there is a notable amount of football revenue, but its bowl packages are not at the same payout level as a Power Five conference, so basketball dollars remain very important. At this point, CBS projects four AAC teams in the tournament (though neither of the Florida schools). And, then there is the Atlantic Sun, which is known as a single-bid conference. The tournament champion gets to go to the Big Dance and no one else is ever likely to make it. Units earned are a big deal, and that’s why its conference tournament attracted national attention last weekend. Stetson ultimately lost in overtime to Florida Gulf Coast University but it created something of a quandary for the Atlantic Sun. It’s not that the conference didn’t have a plan. Had Stetson won, regular season champion North Florida would have received the tournament bid. The real issue is what team would generate more money for the conference. North Florida was the steadiest team during the regular season, finishing with a 10-4 conference record (22-11 overall), but the Jacksonville school was beaten handily by FGCU in the tournament semifinals. FGCU, meanwhile, has something of a tournament pedigree. It was just three years ago that the Eagles, seeded 15th in the South Region, shocked Georgetown and San Diego State on the way to the Sweet 16. After giving Florida an early scare, FGCU ultimately fell to the Gators, but the impact on the Atlantic Sun finances was huge. From 2007-12, the conference fielded one team per year, and that team promptly lost its first game and went home. Six years, six tournaments and six units total. Then came 2013, and suddenly the conference earned three units, more than $4 million, to divide among its member schools across the next six years. 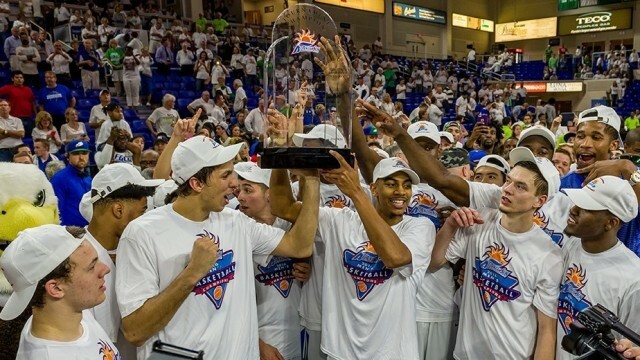 The Florida Gulf Coast Eagles celebrating their Atlantic Sun Championship win. Photo Credit: FGCU. 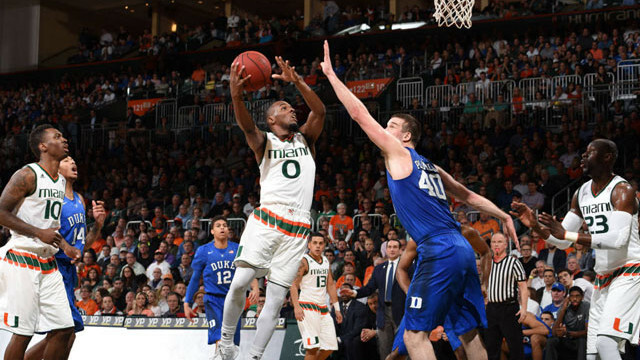 So, even though FGCU and Miami are the only two Sunshine State schools likely to appear in the Big Dance, the conferences to which the various state schools belong will put about 18 teams in the tournament. At least one Final Four participant, and maybe more, will come from that group. Counting cash is not the worst substitute for cutting down nets. Speaking of Tournaments . . . In Orlando, don’t expect the Knights of Central Florida or the Bulls of South Florida to emerge as victors during the 2016 AAC Men’s Basketball Championships. But do figure on a winning economic impact for the region. Held at downtown’s Amway Center, the tournament (March 10-13) consists of nine games, highlighted by the top-seeded Temple, which won the AAC regular season title. The underdog Knights and Bulls were seeded seventh and ninth, respectively. UCF lost its opening game, while USF won, bolstering attendance for its Friday matchup, but the tallies that event organizers are most interested in: 6,000-plus room nights and more than $5 million of economic impact. In addition, although more difficult to quantify, is the national exposure generated from the media and live telecasts for Orlando and Orange County. The Central Florida Sports Commission, UCF and the Amway Center, in partnership with the City of Orlando and Orange County, are hosting the event. This is the third year of the AAC post-season tournament, with previous events held in Memphis and Hartford, where it returns next year. Orlando was to be the 2017 site, but it lured a bigger fish — actual games in the subsequent NCAA Tournament. The AAC is a product of the split of the original Big East, which held its tournament at Madison Square Garden. Amway isn’t quite the World’s Most Famous Arena. All (dollar) signs, though, were pointing up. Downtown St. Petersburg — on a 14-turn, 1.8-mile course that runs south from Central Avenue along the Bayshore Drive waterfront, beside and through Albert Whitted Airport, and north on First Street South back to Central — will be quite the spectacle this weekend (March 11-13). Just don’t blink because you are likely to miss something. Friday morning marked the start of the annual Firestone Grand Prix of St. Petersburg, which culminates in the Verizon IndyCar Series race Sunday afternoon and raises the green flag on the 2016 IndyCar season. Not only will the weekend attract more than 150,000 enthusiasts and onlookers, but also city officials estimate 1 million television viewers in 200 countries will tune in. 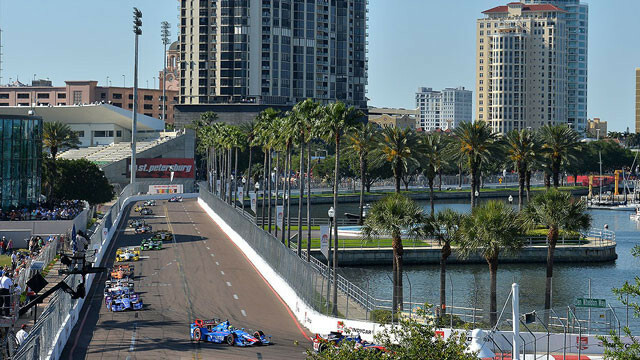 The 14-turn, 1.8-mile course runs through the streets of downtown St. Petersburg, Photo Credit: IndyCar. A mirror of Monaco? Just maybe. The event, in its 13th year, fills some 40,000 hotel rooms and results in an estimated regional economic impact of $48 million. The county’s Tourism Development Council contributes $250,000 to the event, ultimately netting a hefty ROI. The Verizon IndyCar Series race is set to start at 12:45 p.m. Sunday, with Col. Dan Tulley, of 6 Air Mobility Wing and MacDill Air Force Base commander, waving the flag as honorary race starter. Expect traffic to be heavy — on the course and throughout downtown St. Pete. Photo Credit: Top image courtesy of University of Miami.